This spring, Green America is teaming up with author and farmer Acadia Tucker to answer questions about Climate Victory Gardening. In this blog, you'll get to know Acadia, what motivates her, and why she's such a great candidate for answering your questions. Green Business Network director Fran Teplitz submitted the following letter to the Natural Resources Committee of the California Assembly in support of new “Skip the Slip” legislation. The bill was inspired by Green America’s Skip the Slip campaign urging businesses to use electronic receipts rather than toxic and wasteful paper receipts. March is celebrated as Women's History Month to commemorate the accomplishments and contributions of women to American history. The following is testimony from Fran Teplitz, Director of Green America’s Green Business Network, at the Maryland State Senate hearing on February 21, 2019 in support of increasing Maryland’s minimum wage to $15 an hour (SB 280). Big companies have a history of oppressing small businesses and putting a heavy burden on low-income communities. For example, Amazon’s presence in Seattle caused rising housing costs and pushed out local mom-and-pop shops. "Companies like Honest Tea, Seventh Generation, Stonyfield Farm, and hundreds of our peers would not have made it without the supportive network that Green America represents." Leaders make special gifts to advance Green America’s mission of building a more just and sustainable world. Members of the Green Business Network lead the way in green innovation. 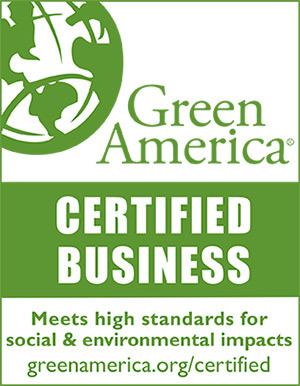 Earn Green America’s trusted Green Business Certification, the leading authentic trustmark for true green business practices. Since 1983, we’ve evaluated businesses for social and environmental responsibility. Our certification is tailored for small green businesses and social enterprises in over forty industries. Your business could win $5,000 from Green America’s People & Planet Awards. We award $20,000 annually to small green companies for their outstanding contributions to a more just and sustainable economy. Get the latest on our seasonal awards and meet the innovative past winners. When you join the Green Business Network, you’re joining together with more than just your peers in the green entrepreneur and social enterprise space. You’re part of a national movement to build a more just and sustainable world. The Green Business Network® is a program of Green America, the nation’s leading nonprofit in growing the green economy. We harness economic power—the strength of consumers, investors, businesses, and the marketplace—to create a socially just and environmentally sustainable society. As a Green American, you’ll support our campaigns for safer food, fair labor, clean energy, and responsible finance.